This paper seeks to explain why biodiversity conservation and agriculture are perceived by mainstream conservationists and agricultural policy makers as incompatible, and as a result people living inside or nearby protected areas are often prohibited from farming. 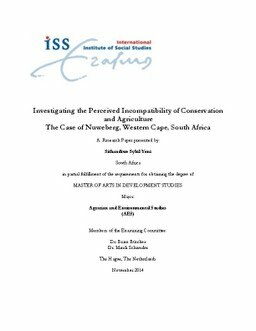 The central argument of this paper is that the dominant perception of the incompatibility of conservation and agriculture is the result of a political project which is situated in the ideological framing of conservation and agriculture. The theoretical framework is informed by linking the discussions on (i) CBNRM as a conservation policy instrument (ii) agroecology as an alternative farming model to industrial agriculture and (iii) biodiversity conservation which is about protecting and managing nature through the creation of protected areas. It is established that the point of difference between the three concepts is the idea of human/nature separation. Agroecology promotes the connection between human and nature and therefore encourages the link between conservation and agriculture while CBNRM and biodiversity conservation are based on the principles of separation. Lessons from the study case in the Nuweberg settlement suggest that this idea of separation of humans from nature results in the marginalization of inhabitants’ land-based livelihoods particularly agriculture. The paper further explores implications for the various actors involved in this case, in the attempt to link conservation and agriculture. The paper calls for the government to implement a strategy to re-think land access and support to small-scale farmers particularly those who practice agroecology, while for the conservation authorities at the public conservation institution Cape Nature need to revive CBNRM. In conclusion the paper highlights the crucial role of NGOs, social movements and networks of small-scale agroecological farmers to engage more with academic research in order to strengthen their advocacy strategies for land access, agroecology and better livelihoods.